Every year crane vessel Thialf returns to the Calandkanaal for maintenance and loading and unloading various parts. After the visit the ship returns to open sea for tasks all over the world. 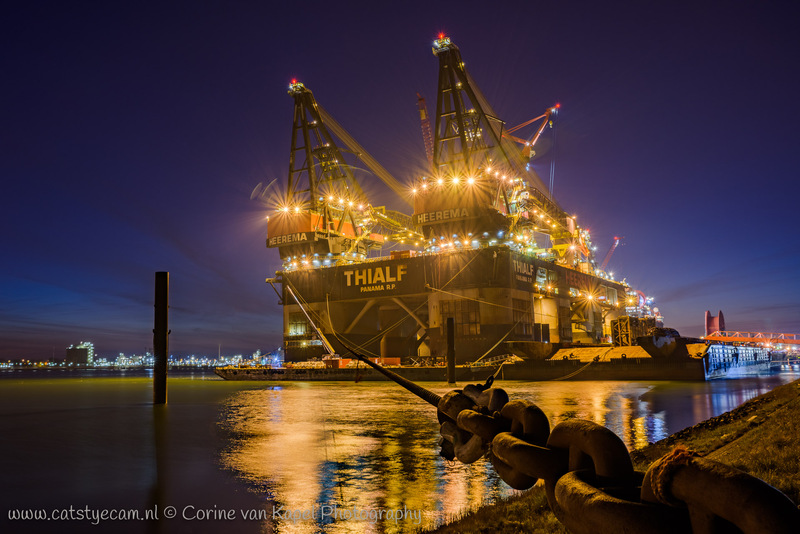 On Monday night the 14th of March 2016 the Thialf was back in the Rotterdam harbor. It was a cold and clear night, so very suitable for night photography. The mammoth ship with its pontoons and two gigantic cranes is almost 90 meters wide and more than 200 meters long. On board there is room for 736 people to sleep. In short an impressive ship. And because at night it is beautifully lit, it is also a worthwhile photographic topic. So with my camera and tripod I went to look for a good spot along the Calandkanaal and made a series of nightshots of the biggest crane vessel in the world.